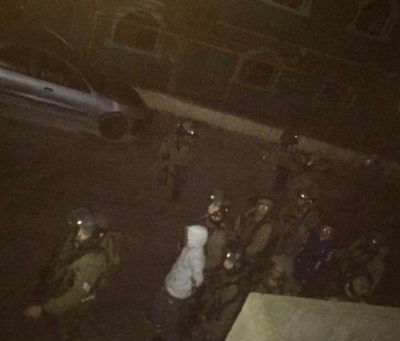 Dozens of Israeli soldiers invaded, on Monday at dawn, Nabi Saleh village, northwest of the central West Bank city of Ramallah, and abducted a wounded child, and nine other Palestinians, mainly children, from Tamimi family, during extensive and violent searches of their homes. Media sources in Ramallah said the soldiers abducted a wounded child, identified as Mohammad Fadel Tamimi, 15, and his brother Tamim, 17. 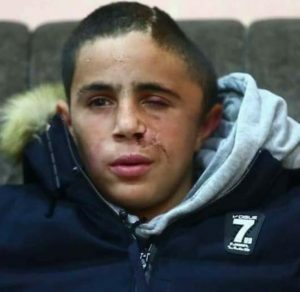 It is worth mentioning that Mohammad was shot two months ago in the head, and is still in a serious condition, awaiting a new surgery scheduled for early March. The soldiers also abducted Soheib Sameeh Tamimi, 14, Ahmad Sami Tamimi, 19, Moayyad Hamza Tamimi, 17, Mohammad Mojahed Tamimi, 15, Amjad Abdul-Hafith Tamimi, 28, Omar Saleh Tamimi, 29, Islam Saleh Tamimi, 21, and We’am Eyad Tamimi, 17. 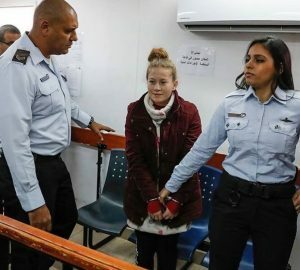 Nabi Saleh has been under constant Israeli attacks, invasions and violations since the army abducted ‘Ahed Tamimi, 17, and her mother, especially after various Israeli media outlets, Israeli social media posts and even government officials started a massive incitement campaign against Ahed, and the entire village. The village has been frequently attacked by armed colonialist settlers, who also closed roads and tried to prevent the Palestinians from entering or leaving it. The Palestinian Detainees Ministry warned of the sharp rise in the Israeli abductions of children, and the constant violent invasions and searches of homes, which led to extensive damage and terrified entire families. Commenting on Monday’s invasions of homes and abductions, the committee said that the soldiers invaded Nabi Saleh and Deir Nitham town, northwest of Ramallah, and carried out massive violent searches of homes, and added that such violations reflect the racist nature of the occupation and its military, targeting all Palestinians, especially the children. It called on the International Red Cross and all legal and human rights groups to intervene and provide the needed protection to the Palestinian people, and their properties.